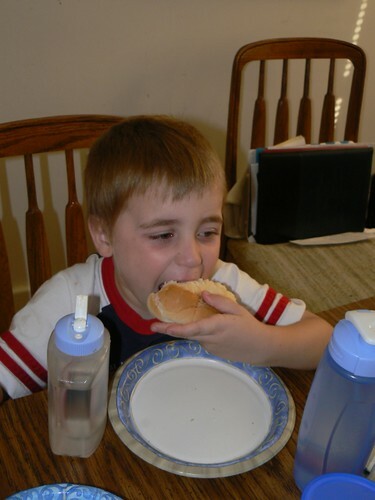 When NHL was little he would eat almost anything that you gave him. The only exception to the rule was tuna fish. He has never liked it and would always refuse it. Of course his tastes have changed over the last year. Now he is much more opinionated about what he will put in his mouth. "Now that I am five, I will eat tuna!" JL and I looked at each other and asked NHL what he was talking about. He continued to tell us that he now liked tuna since he was five and a big boy. Did we believe this? NO WAY! JL and I just figured it was all talk and would test it eventually. Last night JL and I had salad with tuna on it. We figured the boys could have left over whole wheat pasta and life would be good. NHL heard what I was making and attacked me for some tuna. Yes, he was right in the kitchen waiting to try it out of the can. Sure enough he declared it yummy and asked for a sandwich for dinner. Who are we to deny our child the tuna that he was now big enough to enjoy? Since we knew nobody in our family would believe this we documented the event. 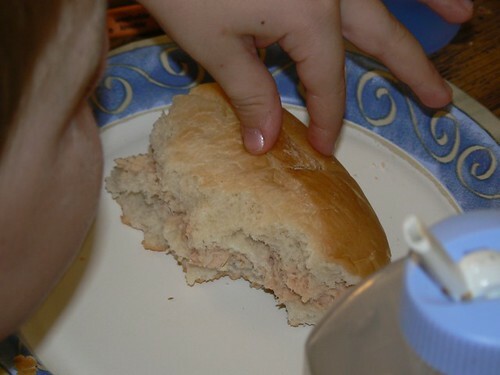 I present you with NHL eating his tuna sandwich and a close up to show the tuna as well. Of course now I wonder what else we can try to get him to eat or do since he is five and a big boy. Hmmmm. . . must make a list of items to test out. How funny! You ought to ask him what else he’ll eat now and see what he says. Say! Maybe helping around the house works that way too when you turn five. Give that a shot as well. Keep us posted! That’s awesome! It’s good when kids will give something a second chance. I hope my little guy will learn to like it….I love tuna noodle melt! Just wanted to thank you so much for my birthday wishes you left on my blog! Geez that looks good! Thanks for stopping by and leaving me well wishes on my blog. I wonder if that will work with my new 7 year old? LOL!